Funded by generous gifts from Andrea and Blake Brown ’68, the museum recently created the Don Lofgren Paleontology Research Lab and renovated the Malcolm C. McKenna Fossil Preparation Lab. Highlights include a laser scanner and 3D printer for replicating specimens, a state-of-the-art digital imaging system capable of photographing specimens under a millimeter in diameter, a dozen computer workstations, specimen storage cabinets, and work tables. 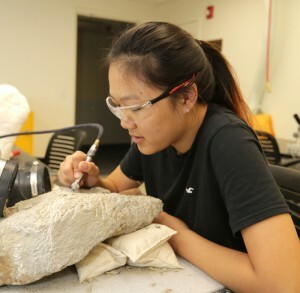 The renovated fossil preparation lab, upgraded to include ten mobile and customizable work stations with the latest equipment, is populated daily by Webb students as they clean and repair fossils they find on peccary trips. Once prepared, these fossils are curated and then either put on display or placed within the permanent collections.